NARA Report Says 98% of Agencies are on Track to Manage Digital Records by 2019 Deadline. Really? The National Archives and Records Administration’s Federal Agency Records Management 2017 Annual Report touts an eyebrow-raising statistic: “Ninety-eight percent of agencies show confidence in meeting the OMB/NARA Managing Government Records Directive (M-12-18) target to manage all permanent electronic records in electronic format by December 31, 2019, and say these records are already created and maintained electronically.” This statistic – generated from analyzing agencies’ self-assessments of their own progress – should be taken with a grain of salt. A true test of how well agencies are prepared to manage their electronic records is how they respond to FOIA requests for such records – and so far, the rubber is nowhere near meeting the road. The National Security Archive’s 2018 FOIA Audit contradicts these agency self-assessments. Our analysis found that two out of five federal agencies claimed that they were either unable or not required to respond to a targeted Freedom of Information Act (FOIA) request for agency emails. Many more lost the requests. 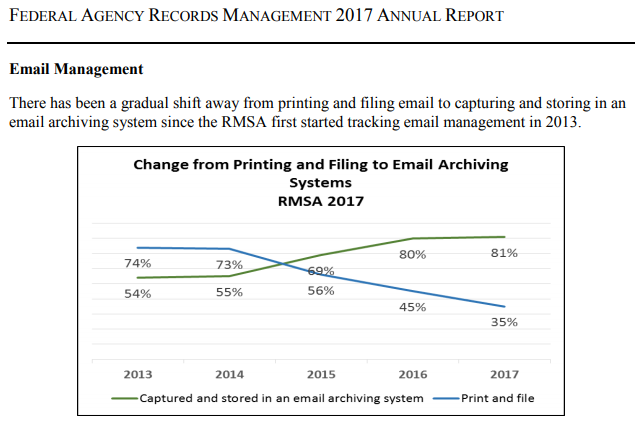 The responses show that – well over a year after agencies were required to manage email electronically – FOIA requesters are often not seeing the benefit of any improved electronic records management. From the National Security Archive’s vantage point, it would be better if NARA actively oversaw this electronic records management process, as opposed to taking agency self-assessments at their word. To the question “When was your agency’s directive(s) last reviewed and/or revised to ensure it includes all new records management policy issuances and guidance?” Seventeen agencies admitted it’s been since at least 2012, making it hard to see how 98% of agencies have incorporated electronic management guidance directives issued afterwards. Fifteen agencies said there were no internal records management trainings. Thirty-one agencies claimed they had not identified the vital records of all their program and administrative areas. Thirty-three agencies said staff responsible for FOIA can never search for records without contacting others. Twenty agencies don’t track when their permanent records are due to be transferred to NARA. Ten agencies admitted that they do not comply with the requirements under Executive Orders 13526 and 13556 for managing classified and controlled unclassified information in systems that contain electronic records. Seventy-eight agencies do not have approved records schedules covering electronic messages including text messages, chat/instant messages, voice messages, and messages created in social media tools or applications that meet the definition of a Federal record. An unredacted September 8, 2017 email released as part of an ongoing lawsuit confirms that the Justice Department did not initially want to add a controversial citizenship question to the 2020 census. The email, written by the Commerce Department’s Earl Comstock, notes that “Justice staff did not want to raise the question given the difficulties Justice was encountering in the press at the time (the whole Comey matter).” Comstock also directed staff to determine if Commerce could add the citizenship question to the census on its own. This July the Commerce Department released redacted versions of the September 8 email, among others, in court filings that that show the Trump administration discussed adding a citizenship question to the 2020 census within months of Trump taking office. The 600-plus emails, which NPR has filed FOIA requests for to help peel back the redactions, contradict the administration’s earlier claims that the question was being added at the request of the Justice Department to better enforce the 1965 Voting Rights Act. President Trump gave the DOJ the highly controversial order to declassify information related to the investigation into Russian interference in the 2016 election with the purported belief this will clear a cloud that has hung over his administration since Inauguration. The statement specified that the DOJ was to “immediately declassify portions of the secret court order to monitor former campaign adviser Carter Page, along with all interviews conducted as officials applied for that authority,” as well as to release unredacted text messages of certain FBI officials. Many of the documents at issue are the subjects of current FOIA litigation, including cases brought by USA Today’s Brad Heath and his attorney, Mark Zaid, and investigative reporter Jason Leopold. The government, as a matter of routine, redacts too much information on baseless national security grounds, and some of these documents should have been released already under the FOIA, but the political nature of the order is unsettling to many. Politicization concerns aside, it’s not likely that Trump will be able to get the records released fully redacted. As Zaid tells the Washington Post, “In our FOIA cases, the Department of Justice — Trump’s DOJ — has ardently argued that disclosure would harm existing investigations and damage national security.” Records concerning an ongoing investigation, particularly those being withheld to protect sources and methods, are among the most highly guarded in the government and are incredibly unlikely to be released. Trump, as evidenced by the JFK Assassination Review Board records release, has also proven unable to corral a bureaucracy of securocrats or rein in DOJ lawyers who can stymie the declassification of records that are of incredibly high public interest, and whose release is backed both by the president and congressional mandate. As the National Security Archive sees regularly, all it takes is one reviewer at one agency to say a document must be keep secret, and it will stay secret despite the sometimes-overwhelming merits of declassification. It should also be noted that the president’s order was issued in a press release, not a formal directive, raising questions about agencies’ ability to pushback against release. Cause of Action has a thorough rundown here. The National Security Archive’s Cyber Vault just launched the Cyber Glossary – a new resource for the cybersecurity community, journalists, students, and the general public. The cybersecurity field features a profusion of issues and concepts that complicates the work of advanced practitioners and discourages those without technical training. The Cyber Vault has collected and organized hundreds of terms from a variety of government sources in one place to facilitate the public’s navigation of the terrain. Each entry is identified with a source – often more than one. The Cyber Glossary will have regular updates from agencies such as DHS, DOD, and the NSA. We look forward to your feedback and further suggestions.